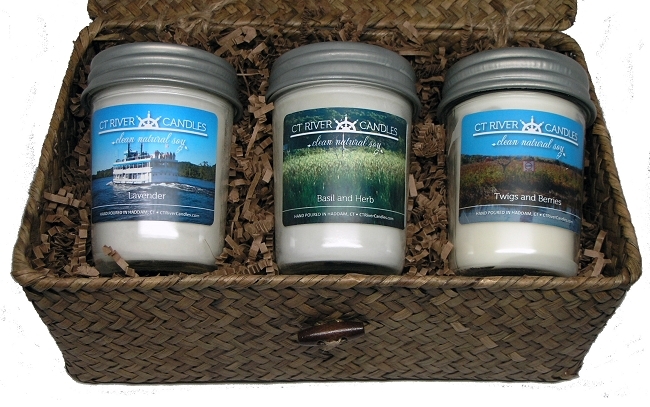 Our Soy Candle Gift Baskets are wonderful for gift giving. 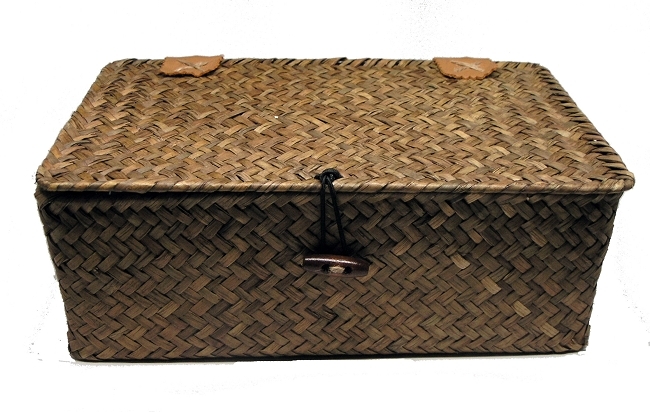 A quality made, reusable basket with hinged lid displays three of our Preserver Jar Soy Candles. Choose three fragrances with your choice of a black or pewter lid. Include a Gift Message and we will include a Customized Gift Card featuring a beautiful Connecticut River Photo. Preserver jar soy candles are hand poured using 100% soy wax and can be dyed or undyed. Please refer to our Scent List for the dye color used for each candle scent if you choose dyed as an option. Otherwise, the soy candles will be left in their natural white soy color as shown in the photo. Note:candles are individually packaged in bubble wrap for shipping safety. I gave this basket with three tropical scents as a hostess gift when we visited friends in Saint Croix last Feb. They loved the way the basket looked and the labels especially as they live along the CT River also. The candles burn so cleanly and the way the labels look is just so clean looking. Brenda even hand delivered them to my house !...thank you CT River Soy Candles for making such a lovely candles....this basket is VERY nice quality also. I ordered the gift basket for our son's girlfriend as a birthday gift. When it arrived today she was totally delighted. As she wrote "the candles smell wonderful and the basket is beautiful." I knew Brenda would work her magic, and she did! I'll continue buying gifts here, and encouraging people to have her make favors for showers, weddings, any special occasionl These candles and Brenda are just the best! And my own house is filled with her beautifully scented candles!!!!! !